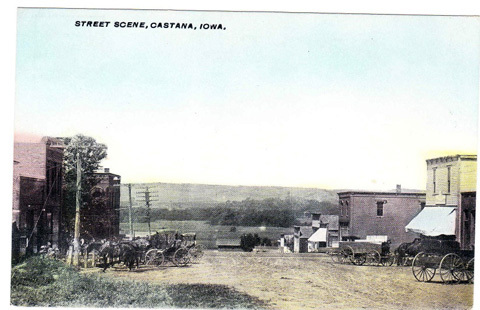 With a population of 452, Castana is a municipality of thrift which is surrounded by one of the best farming communities in Monona county, and its merchants, ever alert to please their patrons, carry large and varied stocks, thus holding trade at home that might, under adverse circumstances be diverted to some other community. The town has a municipally owned water system with fire plugs on the street corners, the water supply being secured from a deep well. It is fine drinking water, no filters being necessary, because it is clear and pure and without sediment. Electricity for lights and power is supplied by the Iowa Light, Heat and Power Company, which recently took over the plant at Mapleton. Everybody in Castana is a volunteer fireman, and the fire-fighting equipment consists of a hose-cart and hose. All sidewalks are paved. Castana has three churches—Congregational, Christian and Seventh Day Adventist, and a Consolidated school—as good as there is in the county. The Congregational church building has recently been turned into a community church. The Northwestern railroad passes through the town. 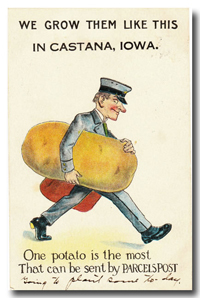 The business interests of Castana are represented by two banks, two hardware stores, two grocery stores, one general store, lumber yard, harness shop, elevator, blacksmith shop, barber shop, garage, two physicians, drug store, three cream stations, two oil stations and a shipping association. Mayor—Lawrence Nelson; Clerk—H. M. Connor; Treasurer—Ernest Baumann; Councilmen—William Kennedy, Charles Ward, M. L. Gordon, Charles Riley and Max Walters; Marshal—Pete McCall; Justice of the Peace—C. D. Bennett. Among other things, Castana has a splendid weekly newspaper, a city park located in the heart of town and one of the prettiest in the county, and a town hall. The beautiful village of Castana was laid out by the Western Town Lot Company in the summer of 1886, and one of the first buildings erected was a warehouse of Day & Co., being completed July 28th, 1886. The railroad tracks were laid past the depot in April, 1886. 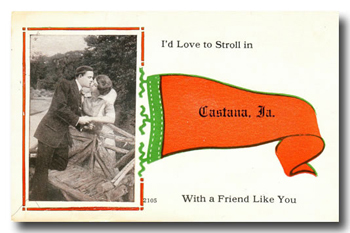 In the fall of 1886, W. T. Day & Co., general merchants at what was called Old Castana, erected a store in Castana and began operations. S. L. Willetts moved his blacksmith from Old Castana and put up a shop in the new village. John C. Carritt opened the first grocery store there. A. J. Lynch had the first hardware store and R. H. Loueks put up a building and opened a drug store. This was later purchased by Dr. J. H. Talboy. Colis S. Penor erected a building for a barber shop and a pool hall. The first lumber yard was operated by the Green Bay Lumber Co., which is still in operation there. Waples and Copeland opened the first implement house in the new town. The first bank in Castana commenced business September 4th, 1888, by George P. Wiley, who erected a building and conducted a general banking and insurance business. The Chicago & Northwestern erected a depot there in the fall of 1886 and the first agent was C. W. Gould, being later succeeded by Ben Smythe. The first attorney hung out his shingle from the office of the Green Bay Lumber Co. in Castana on October 1st, 1889. His name was W. S. Morton. In 1924, M.L. Gordon is listed as one of the town councilmen in the above historical news article. Monona County Iowa; born 1876; age 29, born Iowa; his father born in Scotland; his mother born in New Jersey. 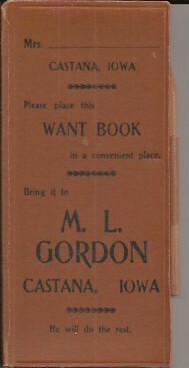 2/2017 ~Thanks to Mr. Milford Cunningham & Jim Peterson for sharing the photo image of ML Gordon Department Store promotion booklet. What a great keepsake find!